Dillon Fitts of Insource Renewables gets some of the solar panels ready as they were getting installed in this Oct. 22, 2017, file photo. Bangor officials will soon seek bids for the development of solar arrays on unused city property after a recent study estimated such a project could save the city $4 million on electricity costs over the next four decades. The study by Maine-based solar energy developer ReVision Energy, Inc. also helped identify a site at the corner of Maine Avenue and Godfrey Boulevard where the city could, with some work, place 17 rows of solar panels. On Monday night, Bangor Finance Director Deb Cyr presented some of ReVision’s findings during a meeting of the City Council’s finance committee. She said that a representative from ReVision was not able to attend the meeting. Cyr’s presentation included a graph showing that the price of photovoltaic technology has fallen about 80 percent since 2009, according to the Solar Energy Industries Association. Cyr also told the committee that there would be multiple ways for the city to invest in a solar array, including buying the array outright or — through a power-purchase agreement — buying power from an entity that would own the panels. Either way, the solar panels would sit on city-owned land and the power they generate would help offset the city’s municipal electric bills. 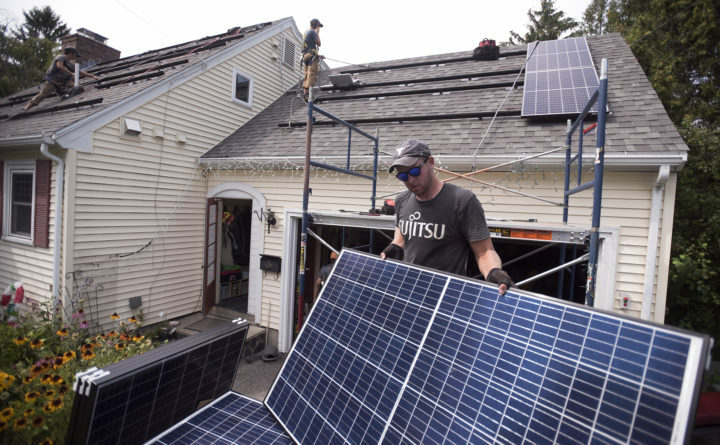 The ReVision study said that under a power-purchase agreement for solar power, the city could pay $2 million on power over the next 40 years, compared with $6 million if it continues relying on traditional utilities. Last November, the finance committee accepted ReVision’s $8,600 bid to do the feasibility study. The city has identified several properties that could house the solar arrays, but Cyr only identified one: the 13 acres at 611 Maine Ave., just east of the airport. That property was previously used for the handling of compressed natural gas, Cyr said Property records listed the parent company of Bangor Gas Co., Energy West Resources Inc., as a recent occupant of the land, but Cyr said it leased the land from the city. After a short discussion, a majority of the five-person finance committee voted to authorize the city to keep studying the merits of developing municipal solar projects. As part of that work, Cyr said that she would seek bids for the project ahead of the City Council’s budget negotiations this spring. Sprague added that he would like the city to eventually consider how local businesses could tap into the energy savings of a municipal solar array. But Councilor David Nealley noted that a solar developer had done the study and urged the city to be more cautious about going forward with the project. He said it would be hard to forecast energy savings from a proposed solar array over 40 years. Nealley also invited James LaBrecque, a Bangor resident and alternative energy critic who advised former Gov. Paul LePage on energy issues, to speak about other ways the city could save on its energy costs. LaBrecque said that installing heat pumps on buildings is a more efficient way to lessen dependency on fossil fuels, among other arguments against solar power. He also said that the practice of net metering — in which entities that generate solar power receive a corresponding credit on their energy bills — increases costs for other ratepayers who must pay a wider share.